More than 1.8m Australian households have already embraced the clean and cheaper energy option provided by that great big, yellow ball in the sky. But for many others, the cost of installation (on average $6,000 per household) is a massive barrier to their solar dreams. But recent world events are rapidly bringing down the price of solar panels – making the conversion to solar even more cost-effective for wannabe solar homeowners. Two key events have seen a collapse in demand and prices of standard multi-crystalline solar panels – one of the most common types used in rooftop installations..
First, US President Donald Trump announced in June a 30% tariff on imported solar panels. Prior to this, the US renewable energy industry was growing fast based on plants being constructed from imported solar panels from Malaysia, South Korea, China, Thailand, and Vietnam. This announcement led to many large-scale utility projects being put on hold and the suppliers left with huge gaps in demand. Shortly after that announcement, in a major policy shift, the Chinese government halted approvals of new subsidized utility-scale solar plants, limited the amount of smaller-scale generation and shrunk the subsidies it provides to solar generators. So in a very short space of time the demand for solar panels worldwide has been massively reduced due to an oversupply, with prices falling rapidly as a result – by up to 12.5% in some markets so far and industry forecasters, Bloomberg New Energy Finance, are suggesting they could drop as low as 34%. 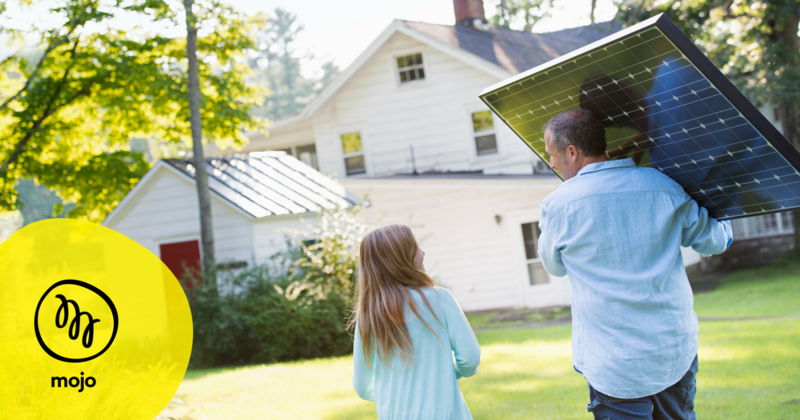 So now’s a great time to start making your solar dreams a reality! If you’d like to know more about solar energy check out our “solar mythbusters” factsheet. You’ll also need to get in touch with an installer today to start planning your options, and remember Mojo Power when you’re looking for an energy company to partner with – we have very competitive rates and one of the best feed-in tariffs on the market.